The GTX option on the Belvedere targeted the upscale performance car market. It made its intentions plain with a host of sporty appearance items along with performance engines and suspensions. 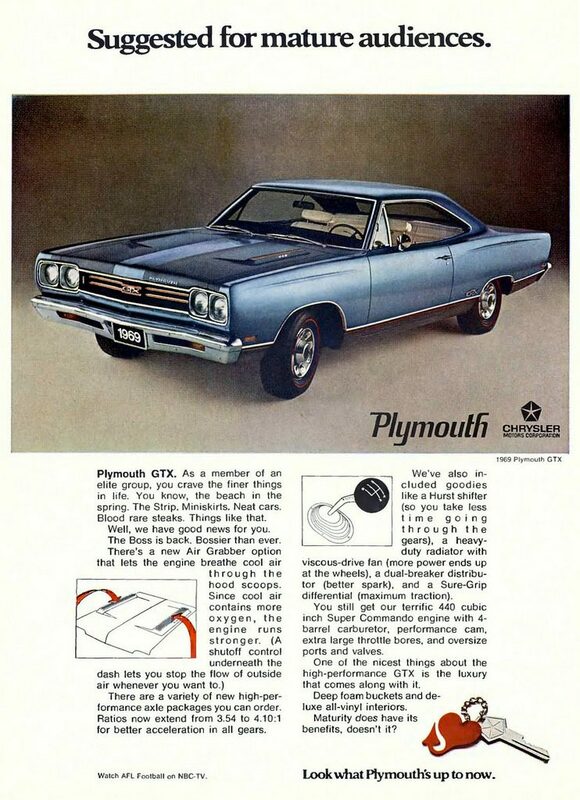 Although overshadowed by its more famous little brother the Road Runner, the Plymouth GTX actually predates that budget-minded muscle machine by one model year. 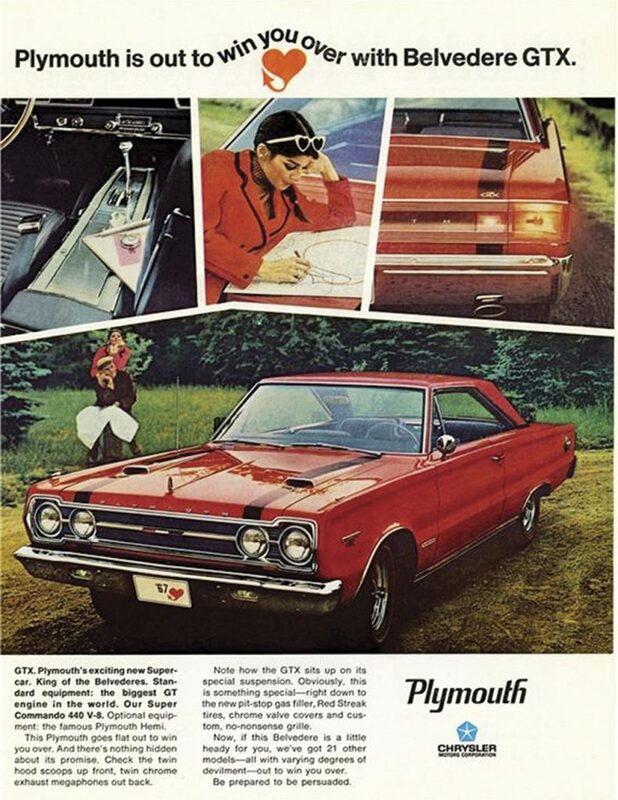 Plymouth introduced the “GTX” as an option package on 1967 Belvedere hardtops and convertibles, and from the outset it was positioned as an upscale muscle car—the so-called “gentleman’s hotrod.” Plymouth’s second hottest engine—the Super Commando 440—came standard, and checking the box for the GTX package was the only way to gain access to the 426 Hemi engine option in a Plymouth in 1967. 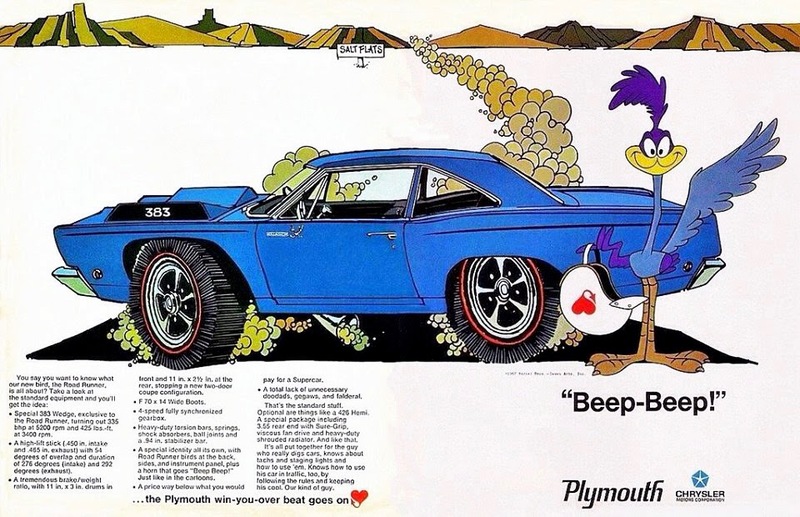 For 1968 most of Plymouth’s marketing focused on the new Road Runner, which targeted the youth audience with high-value bang for the buck. That would all change in 1968 with the launch of the Road Runner. 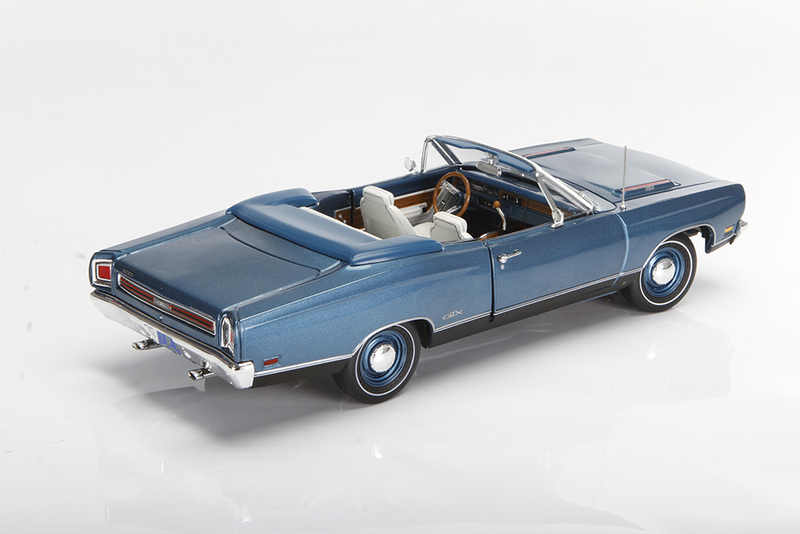 With it came the redesign of the B-body; gone was the boxy Belvedere, replaced by a curvy body that drew heavily from its drop-dead Dodge stablemate the Charger, but unlike the Dodge the Plymouth offered a convertible. Plymouth tried to carve out a niche for the GTX with mature buyers. Styling changes for 1969 were minimal, but the Air Grabber hood had a functional performance benefit. The bargain Road Runner was the big news, but that served to draw a sharp distinction between it and the fully loaded GTX—which offered many of the same features as Chrysler’s 300 letter cars in a lighter, more performance-oriented package, reaffirming the more mature, sophisticated image for the GTX. Visual changes for 1969 would be minor; there was a new grille and tail light treatment, and the hood now offered a functional “Air Grabber” cold air induction hood (previous years’ vents were cosmetic only.) The 440 was again the base motor, but the performance pick was the 426 Hemi. Either could be ordered with a heavy-duty 4-speed or a TorqueFlite automatic. 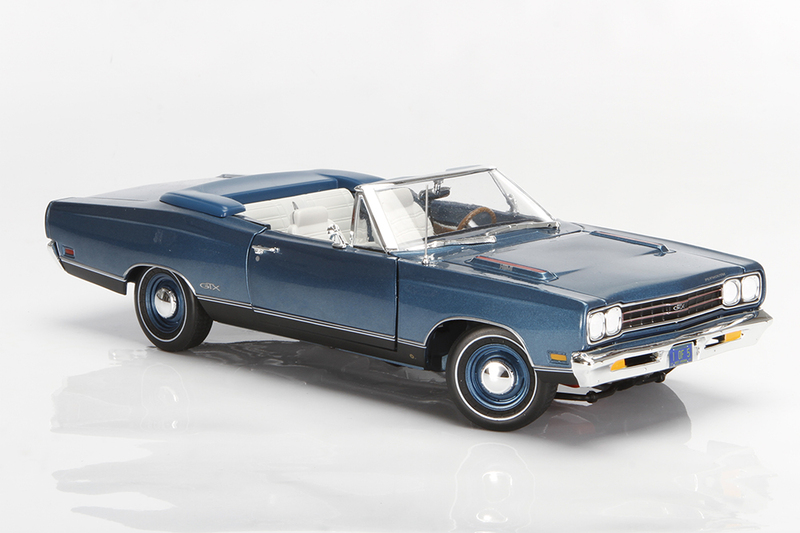 By far the rarest combination for any GTX was the convertible with a 426 Hemi, and the 1969 was the rarest of them all. Just 11 Hemi droptops were ordered—and just five of those had 4-speeds! That 1-of-5 combo is exactly how Auto World has spec’d out this GTX, as reflected on the license plate, as part of its 50th Anniversary of the Hemi celebration series. This casting is loosely based on the old Ertl ’68-69 B-body—as evidenced by the lack of an opening trunk—but it has been significantly updated. The car is bathed in B7 “Jamaican Blue” with matching steel wheels and a premium white vinyl interior. 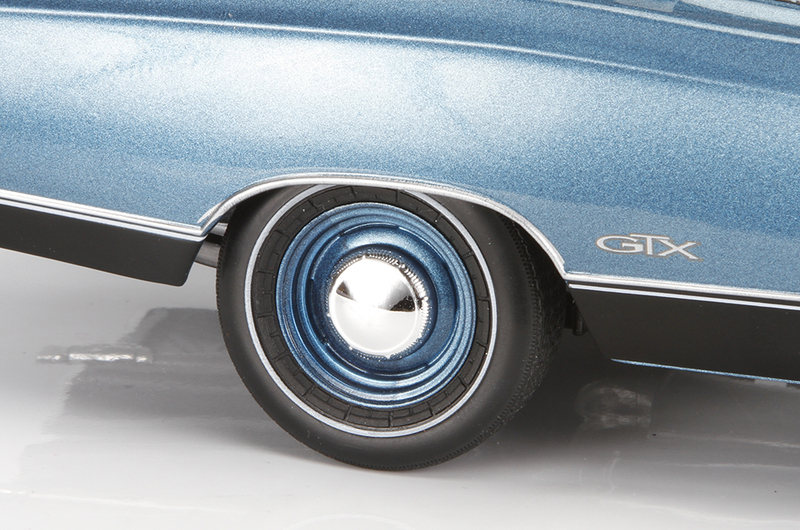 The flat black lower body accent color is unique to 1969 models and exclusive to the GTX. The paint nails the metallic blue hue perfectly, although there is a touch of orange-peel in the flat section between the red hood vents. On the sides of those vents is one of just two places where the GTX advertises the Hemi lurking beneath; (the other is the left rear of the deck lid.) The chromed metal windshield surround is beautifully executed. Being a convertible, this GTX gets maximum impact from its high-contrast white bucket seats, which are faithfully molded from hard plastic and painted with a matte finish. 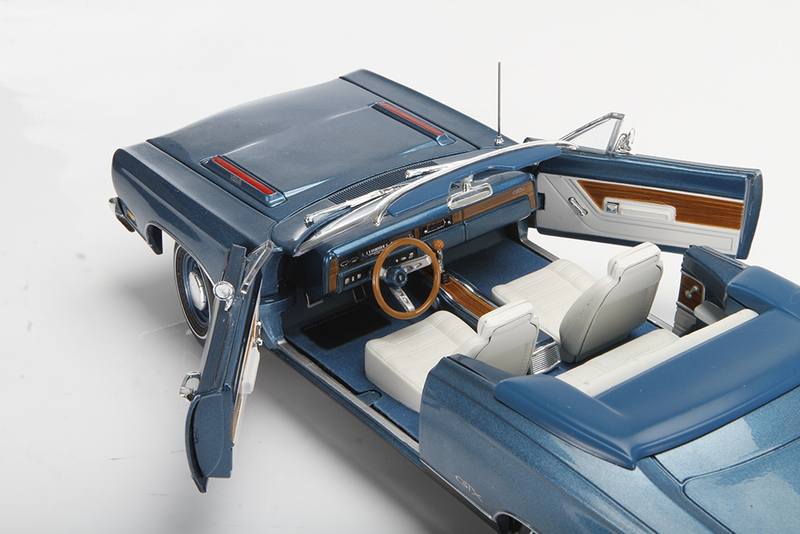 The floorboards have flocking keyed to the Jamaican Blue paint, and there are faux wood grain accents on the dash, center console, and lower door panels. Detail on the instruments is fair but doesn’t really rise to the standard of the rest of the interior. and the pedals are merely molded into the floor and painted rather than separate pieces. The hood rides on old-school hinges, but the throw is good and they are nice and tight so they suspend the hood nicely. Beneath is a rendition of the 426 Hemi that has been significantly updated as well. There are obvious are improvements like the plug wires—which, while a little thicker than scale, are at least present. Upper and lower radiator hoses are there as well, as is the horn attached to the radiator housing. 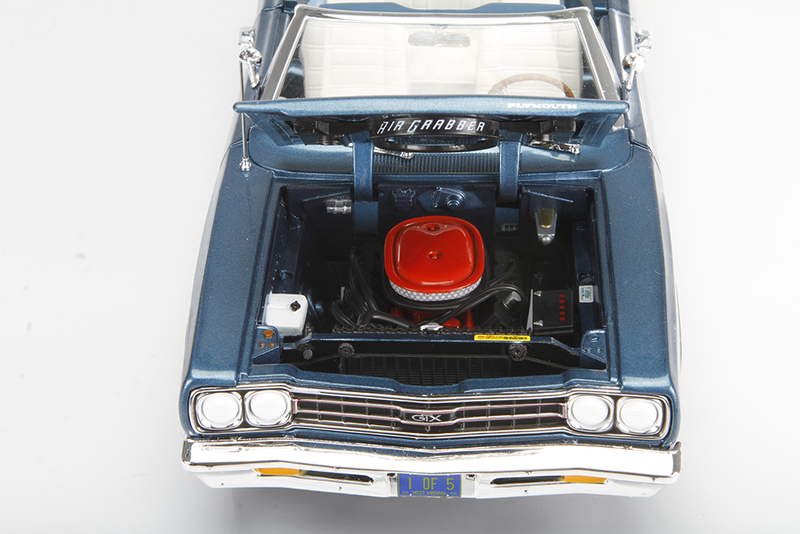 Labels and decals are sprinkled throughout the engine bay, and the orange oval air cleaner (which replaced the chrome round air cleaner from 1968 and earlier Hemis) is spot-on, and correctly lacks the “Coyote Duster” designation of Road Runner models. It also mates up correctly to the “Air Grabber” ductwork on the bottom of the hood. As mentioned above, the trunk on this casting is sealed, but there is nicely molded and painted chassis detail, right down to contrasting gray undercoating and blue overspray from the body. There are some clunky molded holes molded in (legacy items from when the Ertl cars came mounted to base plates perhaps?) but otherwise the underside is very nice. The color-coded steel wheels with chrome dog-dish center caps and well-molded white line tires finish out the presentation. A Hemi and a 4-speed are decidedly race-oriented hardware, and seem somewhat contradictory sitting between the fenders of a high-zoot GTX convertible. No wonder then that just 5 customers were willing to pony up the $700 premium on top of the already lofty $3650 base price of a GTX convertible. But that selective appeal then translates to huge collector interest now, and the car upon which this model is based—one of just two surviving original engine/transmission ’69 Hemi GTX convertibles—is worth north of $250k now. And that makes it a stellar collectable diecast as well. Sure, the casting shows its age in a couple minor areas, but overall this model presents well, and as a 1:18 example of the “gentleman’s hotrod” it shines!